This painting is reminiscent of Van Gogh’s time in Nuenen, where he found that working with peasants as subjects gave him a new perspective in his art. This led to some particularly memorable work. All of our replicas are hand-painted by our team of expert painters. 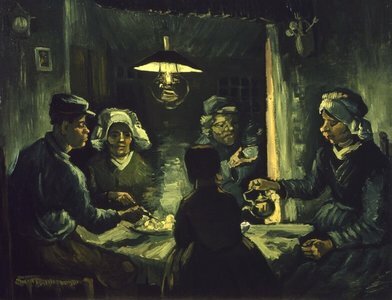 They have studied all of Van Gogh’s techniques, including brush strokes, impasto, colour mixing, rhythm of application, and ambience. 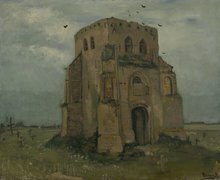 When working on his paintings, Van Gogh eventually moved to Nuenen in search for new techniques and styles to learn. Here, he learned to paint peasants going about their daily lives—these paintings mainly consisted of dark tones and earthy colours. When he asked his brother Theo why his paintings weren’t selling, the latter complained that Van Gogh’s style was too dark. He explained that, to sell, his paintings needed to have rich colour, something Van Gogh was unaccustomed to at the time. However, he continued with his style until he moved to Antwerp and learned how to work with brighter colours. It was during his time in Nuenen that Van Gogh finally started out on his path to becoming a renowned artist. He met several other artists who helped him create his own style, through learning and adaptation. 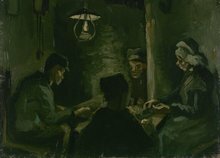 The dark tones that were a part of his paintings, such as The Potato Eaters, signified the struggle that he went through at the time, without having enough money to both feed himself and continue painting. Due to this, he regularly worked with anyone who would sit for paintings for him, as a way to earn extra money for his work. 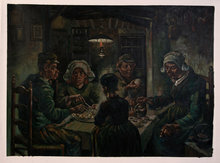 The Potato Eaters series were an especially important work, since at that time, it showed the struggles of the common man and how they struggled to even make enough money to eat. This was something that Van Gogh shared with them, and he captured it on canvas.